Things in Spain are never exactly what they seem to be. This is a painful lesson that even Angela Merkel must have learnt in recent days, especially since she put her credibility so much on the line in backing the country’s deficit reduction efforts. “Spain has really done its homework and I think it is on the right track,” is the message she has been trying to sell to the world. Naturally then she will not have been amused to learn last Friday that rather than the 6% promised under the Spanish stability programme, the country’s deficit in 2011 is going to be something like 8%. Some sort of overshoot was long being anticipated, but such an overshoot? Naturally it isn’t (quite) Greek proportions, but it is still hardly evidence for a credible and praiseworthy effort. This is the thing about Spain, it obviously isn’t Greece, but still all isn’t quite what it should be. Add to this deficit result the fact that the Bank of Spain is reported to be frantically pressuring banks into revising the valuation of their property asssets following the publication by ratings agency Fitch of a report which claims they are currently on average 43% overvalued. And, of course, any major downward revaluation of the repossesed assets will give an entirely new reading for the balance sheets of many of the institutions involved (the Caja de Ahorros del Mediterraneo went from having a 50 million euro profit at the end of 2010 to 1.7 billion euros in losses in June 2011 following the application of just such a mark-to-market procedure – and the savings bank was finally sold to Banc Sabadell for the princely sum of one euro). Put two and two together here, and it is clear that the country’s bond spread may once more be in for a bumpy ride when investors finally recover from their yuletide hangovers. Excuses are, of course, already being prepared for this lamentable state of affairs, and in particular the argument is being run that in fact the responsibility here does not lie with Spain’s central government (which was entirely composed of choirboys and girls), but with a lamentable set of constitutional arrangements which give far too much spending power and control to the country’s regional governments. To some extent this is true, but as I say, it is important not to take everything here at face value, since as ever, all is not what it is made out to be. This advice could, as it happens, have proved useful to New York Times reporter Suzanne Daly who vertently or inadvertently seems to have been taken for a complete ride with the article she wrote for the newspaper last Friday. The focus of the article was purportedly on regional extravagance in Spain, but in the event she seems to have allowed herself to be used to float a political agenda which primarily seeks to take the attention away from the country’s central government, and the responsibility it has for the current lamentable state of affairs. Naturally examples of regional extravagance certainly abound (hell, the entire country was living beyond its means), but I started to smell a rat when I saw the example she chose to highlight in her article – the prison at Puig de Les Bases, Figueres (which just happens to be located only a few kilometres from where I live). What worried me is that the prison you can see in the photo above is NOT an example of something that isn’t needed, like a phantom airport, or a golf course where no one will ever play golf. The problem with Puig de Les Bases is not that there aren’t prisoners waiting to be moved there from the two outdated prisons which are scheduled to close (there are, 300 of them, to which can be added an additional 450 once the new one is open). No, the problem here is that there isn’t enough money to run the place after it opens. This situation is not untypical, since many town halls and regional governments, not to mention the central government itself with its new high speed train network that the country can ill afford, find that they invested money on projects using the extraordinary income they were receiving during the years of “excess” but that now they don’t have the current revenue to keep the facilities created operating. In fact Suzanne Daly does notice this, but she seems to get so carried away with the force of her own rhetoric that she doesn’t catch the significance of the point. So the question is, is this an example of regional profligacy, or an example of cuts which are biting, and a country which is coming to terms with its new reality? The issue, however, goes deeper. The offending prison is in Catalonia, and Catalonia is a region which has long been seriously underfunded by the central government – indeed as was suggested by the regional minister of economics, Andreu Mas Colell, it looks suspiciously like the central government were not paying funds owing to some key regional governments to make the regional deficit look worse, and the central deficit look better. Mas Colell who is a former Harvard professor, and distinguished micro-economist in his own right, recently told the central government that it should be ashamed of itself for withholding money which legally belonged to someone else (in this case 759 million euros for investments which have already been completed) and basically acting in complete bad faith. Naturally, the Catalan government is taking the central government to court over the issue, but given the efficacy with which justice is executed in Spain, I don’t think I’d be waiting for the result before finding solutions to the problem all this represents. “For the last year Catalonia, one of the most productive and most heavily taxed communities, has been undergoing painful cuts in services. And yet, the share of tax money that it contributes to the State and never comes back is estimated today at a staggering 8-9 per cent of its annual GDP. If Catalonia could use even part of those funds to finance essential services for its own population, it would have no deficit and no debt, and could even afford one or two extravagant schemes like those that other regions -and the central government itself- can enjoy as long as they are paid for with somebody else’s money. Catalans would not mind a serious revision of the regional setup, but only if it envisages fiscal responsibility on the recipients’ part, better control over their own money by those who have earned it and more transparent procedures by the central government”. Now one of the points Collectiu Emma didn’t make, but could have, is that Catalonia is one of the few regional governments (and maybe the only one) which has responsibility for administering the prison service. Catalonia also received so little money from central government in 2011 that it effectively ran out of cash in December (not because it is “extravagant” but because it is seriously underfunded) to such an extent that it was not able to pay all public servant salaries for December before the end of the year. So in fact one of the reasons the prison is lying idle is that the central government is not forwarding money it has a legal responsibility to transfer, and the reason it is doing this is to massage its own deficit, and encourage people like Susanne Daly to write the article she wrote. It gets worse, since some of the “misinformation” about the situation in Catalonia has, in my opinion, a deliberate political intent – to recentralise Spain. This is certainly the objective of tax minister Cristobal Montoro, since many in the Partido Popular are already very fed up with the fact we insist on using our own language, and doing things our own way (like banning bull fighting). “And while Spainâ€™s overall fiscal status is nowhere near as dire as Italyâ€™s, it has another problem all its own, as the new budget minister, CristÃ³bal Montoro, made clear Friday: serious budget shortfalls in its 17 autonomous regions, which have spent recklessly in the past decade”. It is also striking how the article also draws attention to spending issues in the community of Andalusia (which is the only community the socialist PSOE really controls now, and which the PP hope to win in elections in the spring) while there is no real mention of communities like Valencia, or Galicia, which are controlled by the PP and where there are plenty of examples which could be mentioned, like the phantom airport in Castellon, built under the eager eyes of former Valencian President Francisco Camps, who had to resign and is now facing corruption charges in a trial which is currently attracting a lot of media attention. Now I am sure, as the Collectiu Emma people point out, there are many examples here in Catalonia of projects which were not needed (the Alguaire airport in Lleida would be one), but the key difference here is that Catalans overspent using their own money, while many regional governments (some of them ruled by the PP) did so using Catalan money. 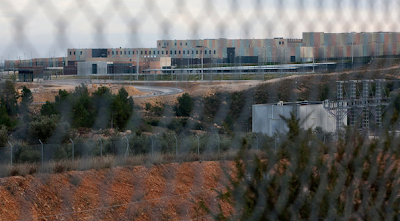 So it is curious, to say the least, that the author decided to kick the article off with a big picture (see above) of a prison in Catalonia to serve as the stylised example to epitomise the problem. But there is another issue being raised here, since it is not clear whether all the attention which is being focused on the Figueres prison is not – in some warped way – a by-product of protests by prison staff unions against the all the reecent spending cutbacks. Searching around for background information, I discovered a most interesting article in El Pais (sympthetic to the Spanish socialist party PSOE) entitled “locos por ir a la carcel” (desparately seeking to go to prison). The gist of this article concerns the plight of a number of unemployed people who have passed the exams needed to have places in the prison service, but who can’t be offered work since the prison is not open. What the El Pais article offers us is the view of a heartless Catalan government making swingeing cutbacks on important social projects. Far from putting the blame on the outgoing socialist lead catalan government who built the prison in the first place, the article blames the new justice department head, Pilar FernÃ¡ndez Bozal, who hasn’t opened because she hasn’t been able to obtain the funding needed. The impression I get is that in this game it is hard to win. At the end of the day the lesson I would advise Suzanne Daly (or Angela Merkel if it comes to it) to learn from this whole affair is that nothing in Spain is exactly as it appears to be, and that few of the arguments politicians and so called “experts” advance are entirely innocent. Mostl “information” circulating in Spain is highly politicised. Really “independent” analysts are virtually unknown. Government and opposition in Spain operate like a revolving door. Crickey, I even saw outgoing Minister in the Zapatero government Alfredo Rubalcaba on TV yesterday, openly criticising Mariano Rajoy’s government for all the cutbacks that have just been announced and for having no policy up to the task of dragging Spain out of its crisis, without even blushing or mentioning that the cuts in question were so big because his government overspent – or tolerated overspending – or that the policies the new government are following were basically identical with those which guided his own government. Far from suggesting that the prison project was an extravagant excess, El Pais implies it is badly needed (since space in the Catalan prison system is extremely scarce), and my feeling is that with crime on the rise after 4 years of continuous crisis, El Pais is probably more right about this than the New York Times author is. Lesson to be learnt: simplistic answers to complex situations are rarely satisfactory. And if you want to come to Figueres and look for a spending white elephant, well, you need go no further than the high speed railway line linking the town with Barcelona. The track has been up and ready for around a couple of years now (see the bridge to nowhere in the photo above), but there is no sign of any train, since there is not sufficient money available to finish the job. But then this particular piece of short term redundancy was planned and executed by the central government on a live-now-pay-later basis, but that wouldn’t fit the story we are being sold, now would it? This entry was posted in A Fistful Of Euros, Culture, Economics, Economics: Country briefings, Minorities and integration, Political issues by Edward Hugh. Bookmark the permalink. Very interesting. I’d love to hear more about fiscal arrangements. You say Spain is not federal. Do the regions collect their own taxes? Or does the central government collect and rebate part? Or what? How would you compare this to the US system, which has some grants but states largely control their own spending and revenues? Do regions issue their own debt? Could they default? No, Spain is not federal, but yes, regions are empowered to raise some taxes. But in terms of the big numbers the central government collects and rebates. The only exception is the Basque region, which collects all its own taxes, and then forwards on to the government the part which it considers is due. It is very different from the US, since the central state has a lot more power than the US federal government. On the other hand the Spanish central government does not have control of monetary policy (which is now lodged with the ECB) so the whole system is very different. But yes, regions issue their own debt, and yes they could, and might eventually, default. The Spanish central government will use the threat of forcing a default to try and force concessions from Catalonia. Curiously though Catalonia can play the same game, since if the region set up a separate state, then it would be Spain who would be forced into default, since they couldn’t service their debt following the revenue loss. Among many, many anomolies here, Catalonia which as a separate state would surely be part of “core Europe” and have a credit rating like Holland or Finland, has now nearly junk bond status, while Andalusia, which partly lives from Catalan subsidies, has a much better rating. I think any fool should be able to see that all of this is eventually unsustainable. Ah that Kafka had lived to read this! My teeth were grinding together while I read Ms Daly’s piece in the New York Times. I hope she has the opportunity to read yours. The international media is so often so misinformed about Catalonia that it makes for painful reading. It is funny that Edward says that simplistic answers are rarely satisfactoryâ€¦. right after throwing to our faces a stream of one liners. would “surely (!) be in the core of europe if it were an independent estate”. If that were the case the whole of Spain should be that club as it has better figures to show. and the first train wonÂ´t roll down that station in less than eight years (!!!) if it all goes as planned. This is not a high speed line and it is only thirty km long. One more thing Edward, some of us just cannot grasp that concept of “catalan money” What on earth is that? Spain is one estate and all its citizens pay the same taxes; taxes belong to the estate and do not have any geographical difference, everybody contributes with the same rate. I have never heard the concept of “Chislehurst money” or “Kensington and Chelsea money” Are you expressing some kind of nationalistic-19th century-regresive concept? By the way, that train line is paid for in part with money from the European Structural and Cohesion Fund. Should you call it Luxemburg money? Remember that Spain is a net contributor to that fund as well. PS: What you call “underfunded” Catalonia received more money, per resident, from the central government than the average region in Spain. It is their problem if they do not know to administer it correctly. That is why catalonia is the region with the highest debt. Fantastic article, I hope it gets more press as this was a very frustrating piece of mass-produced hack journalism at its worst and… wasn’t this just a duplicate of the Vanguardia article that ran some months ago? 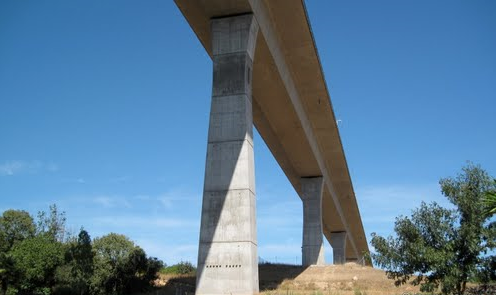 I was under the impression that the AVE link between Figueres and Barcelona wasn’t open due to ongoing construction. There was much fanfare here in Figueres when the link to France opened at the end of the year. While there is the target date of 2012 for that last bit to open, you can still see a tremendous amount of construction in Girona. They’ve had a lot of issues with going under the rivers and while there are tracks from Figueres to Barcelona, it would rather hard to transport people at the moment. They are using the line for freight as far as I’m aware though. The international media in Spain are all radicated in Madrid and Madrid has a special negative way to value Catalonia in front of those media. Madrid lies when speak about Catalonia, cause Madrid is afraid to lose the benefits to own Catalonia. The NY Times is a propoganda rag worth every penny they charge to click on their website, none. Edward: Saturday’ FT Weekend printed a story of how the likely increased overshoot in Spain is all down to the Regions. No region in particular mentioned. Like others here, though, I hope one pf their staffers at least might read your article. As Edward says, Catalonia is grossly underfunded. As shown by the last official data (covering 2005! ), Catalionia suffers a crippling fiscal drainage which is equivalent to as much as 8Â·7% of its gross regional product (see http://www.meh.es/Documentacion/Publico/GabineteMinistro/Varios/BalanzasFiscalesCCAA.pdf ). Note that the German federal system srts an upper limit of fiscal drainage equivalent to under half of this: 4Â·0% of gross regional product. In other words, it pays taxes as a rich country and receives services as a poor country. This is one of the reasons why those supporting independence from Spain outnumbers those that are against it by over 20%, again according to official sources (see http://www.lavanguardia.com/politica/20111025/54236730965/barometre-d-opinio-politica-tercera-ola-de-2011.html ). Thanks for this very interesting article. I believe this reality is deeply relevant to the present Eurodebate. The idea of a big, Brussels-centralized Eurobudget along with Eurobonds and massive transfert from rich to poor is quite similar in its principle to the sad reality that you describe in Spain – only extended to 500 million people. It does not work well in Spain, and it would not work at all at the European scale, while creating tensions between citizens of different countries, and PR wars between the new Madrid (Brussels) and the new Catalonia (Germany). We see worrying signs already. The complete lack of democratic accountability of the ECB and the European Commission makes the situation only more explosive. I sometimes feel that some of these Brussels Eurozealots must really be a 5th column of Euroskeptics, determined to destroy the EU once and for all by re-igniting old tensions with that most powerful of emotion: money. Alternatively, they could be nuts. would â€œsurely (! )” be in the core of europe if it were an independent state. If that were the case the whole of Spain should be that club as it has better figures to show. One more thing Edward, some of us just cannot grasp that concept of â€œcatalan moneyâ€ when mentioning public finance. What on earth is that? Spain is one estate and all its citizens pay the same taxes; taxes belong to the estate and do not have any geographical difference, everybody contributes with the same rate. I have never heard the concept of â€œChislehurst moneyâ€ or â€œKensington and Chelsea moneyâ€ related to where the money that Whitehall expends comes from. Are you expressing some kind of nationalistic-19th century-regresive concept? By the way, that train line is paid for in part with money from the European Structural and Cohesion Fund. Should you call it Luxemburg money? Remember that Spain is a net contributor to that fund as well. PS: What you call â€œunderfundedâ€ Catalonia received more money, per resident, from the central government than the average region in Spain. Thank you Jeronimo for a most revealing and informative comment. I think it will help everyone better understand how people in the rest of Spain conceptualise Catalonia, and how loved and welcome we are. Actually, I had been told people believed things like this, but till I saw that you actually do I had assumed that they had been exaggerating. Edward, I don’t think you are being fair here. Most Catalans, like most Germans, are serious, hard-working people. But the same holds true for Andalusians or Madrid citizens. The idea that people in Valencia are living with Catalan money is just as absurd as the notion that Spaniards don’t work and Spaniards just live with German money. It’s nuts, Ed, you are smarter than that. I may agree that *some* media portray decisions in the Catalan region in a bad light, but quoting pro-independence Catalans when they say Spain steals money from Catalonia is not the best example of unbiased, balanced blogging. Most people in Catalonia feel Spanish, and Catalonia has a huge trade surplus with the rest of Spain. Moreover, the stats about fiscal transfers from Catalonia to the rest of Spain are unreliable. The central government produced several estimates, why would you use the higher estimate? Why not the lower one? Why not the estimate that puts Catalan fiscal transfers to the rest of Spain at the same level as Madrid region’s? In addition, the Spanish tax system is not designed for budgetary self-rule. If a German company sells a car in Seville, the VAT goes to Andalusia. However, if the company is Catalan, the VAT goes to the Catalan administration, even though the sale took place completely outside Catalonia!!! I don’t think Catalonia is paying significantly more to the rest of Spain than its fair share. You may agree or disagree with me, but you can take *your* truth as the only unbiased truth Americans should be reporting. I take the fact that a reasonably enlightened blogger as you falls into this trap of petty politics, as a sign of the times. Times of radicalization, blaming others and putting feelings above reason. My reading of Edward’s article was that Spain’s central government is deliberately withholding payment of sums due – to Catalonia and other regions – with the implicit intent of bringing those regions into default. The question of which region contributes most to central funds (for re-ditribution – or not), whilst important to the largest contributors, is secondary. The game is about re-centralisation of powers. @french derek. Most regional governments do not need any “help” from a malicious central administration for them to get into default. 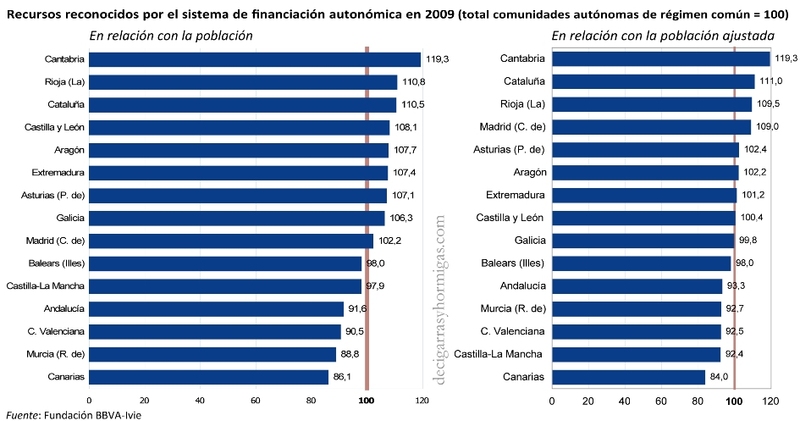 Most regional governments in Spain are already financial zombies. They’re bankrupt, they won’t repay, but they keep on telling they’re just two years behind payment. Ed Hugh’s assertion that the Catalonian government is underfunded is, at least, highly debatable. Catalonia spends 320m euros yearly in their own official TV channels and 27m euros yearly in their own embassies. The Catalan government says it cannot pay their doctors in full and is closing OP rooms while wasting money in, basically, propaganda and jobs for friends. Regional administrations all over Spain have been mismanaged, they have overspent in order to increase popularity for regional self-rule movements and now, for the first time, your regional administration is not the one which gives you things for free, the one which gives you better healthcare and better roads while imposing no taxation on you. Now, for the first time, regional administrations mean higher taxes, cuts in healthcare, etc. at the same time that money wasted in propaganda, regional politicians’ privileges (e.g. official luxury cars) and subsidies for their friends are getting no cuts. That’s why some re-centralisation is being considered by many people. That’s why recent polls say Catalans are starting to feel increasingly Spanish due to the crisis and their regional administrations not giving things away for free any longer. Hi Diego. Thanks for that explanation. This all sounds very familiar: it’s very much the situation in France, with one or two differences only. Whilst our regions don’t have “embassies”, many do have permanent offices in other countries (which our politicians have to visit, to ensure they are “well run”, of course). But then, we have Departements below the Regions, who often cover the same areas. We have seven layers of administration in total: imagine the cost of that. But whilst Sarkozy’s government is de-centralising, and cutting centrally-funded jobs, the regions, departements, et cetera continue to grow (and spend). C’est la vie! Sorry to steal your blog for this rant, Edward. Describing one of the most densely populated regions as “scarcely populated” and “parochial” to me seems all the justification that’s needed to argue against centralism. When centralism comes with such arrogance and haughtiness, it rarely has the best in mind. Plus the Catalans have bad experience in the past and the warning example of French Catalonia, i.e. largely the Department PyrenÃ©es-Orientales right in front of them to see what can happen with centralized education. Compare how many people speak Catalan in P-O and how many speak Catalan in Catalonia, and you know why they want to make very, very sure that no one can ever take Catalan education from them again ever. @Oliver, I wasn’t refering to Catalonia as “scarcely populated”. Please learn to read. Extremadura, Castilla-La Mancha and the like are scarcely populated and they certainly don’t need a parliament at all. It’s up to the Catalans to decide whether they want to have additional politicians or better healthcare. I’d prefer if you’d be able to display a bit more civility. You made the statement in the context of a discussion heavily focussed on Catalonia. You never before mentioned Extremadura. As such, your accusation that I should learn to read demonstrates a considerable lack of both civility and honesty. Totally aside from that, you fail to provide any reason whatsoever that is reconcilable with fundamental democratic values why the degree to which a citizen can influence his life and is represented in the forums that have an impact on it should – within one single nation – depend on whether he or she lives 50 km further east or west. And lastly, you seem to fail at understanding that it is precisely this attitude you display that makes these people want decentralisation. @Oliver, I don’t give a damn what people outside my region do, as long as they pay their fair share into the common budget. I have no moral obligation to be extra nice to Catalans just because they are a minority. I have no patriotic duty to accomodate nationalists so they feel less attracted to independence. I’m just saying Spain is bankrupt, people are on the verge of losing their savings and there is a very real risk of civil unrest. Being extra nice to nationalists, saving jobs for politicians or having 17 regional embassies in Brussels are nowhere near my top priorities. My dear, this article is so simplistic. Certainly, economics affects politics, no election goes by without this element. However, politics also affects economics, and to conclude that Catalonia “would surely be part of ‘core Europe'” is no analysis; it’s just summing up all favourable parts while leaving out any unfavourable ones. Half-baked, in every sense. This is reductio ad absurdum all by itself, and no need to point out that Germany would be better off outside of the EU, and its Western part should not have gone for reunification. Even worse, it seems that you, Edward, are going back from the desired end-state to the single arguments that in this kind of quasi hindsight might be used to further the creation of said end-state. Thus, every phenomenon has to be made to fit the argumentation, getting ever deeper into the realm of the far-fetched. We end up with the paranoia so current among Catalan nationalists, in which everybody is against them, everybody who does not totally agree is evil; manipulative or at least manipulated. Like the lot of foreign correspondents. Any of them might be wrong, any their text might contain huge flaws, but the assumption that they are all somehow part of a conspiracy is the vexing element here. At which point it should become clear that real life offers more details. “My dear, this article is so simplistic. Certainly, economics affects politics, no election goes by without this element. However, politics also affects economics, and to conclude that Catalonia “would surely be part of ‘core Europe'” is no analysis; it’s just summing up all favourable parts while leaving out any unfavourable ones. Half-baked, in every sense. The article â€œRegional Debts Add Woe in Spainâ€ placed excessive responsibility on the regions for the fiscal problems of Spain. In truth, the largest public budget and deficit and most of the regulatory power over fiscal and expenditure issues lie with the central Spanish administration. The matter is a sensitive one, as not everyone in Spain is reconciled to the post-Franco transformation of the country. There is now the temptation, with the economic crisis as an excuse, to turn back the clock. On the contrary, what the situation demands is a concerted effort by central and regional administrations for the success of fiscal consolidation. The year-old, austerity-minded government of Catalonia is looking forward to working with the new Spanish government in furthering this aim. I am amazed that anyone in the gang, namely Jeronimo, even learnt a foreign Language and can read this article. Maybe he can read it, but surely can’t understand it. Else, he would not be in the gang. Candide the difference between you vs Edward is that Ed talks to the locals (in their own language! ), whereas you only read press published in Madrid. Did I write published? I meant manipulated. Let’s apply some logic, ALB (that’s German for elf, right? ): You don’t know me, hence you don’t know what I read or which languages I speak, and to whom. So if we strike out the appropriate passages from the part of your comment that refers to me, we’re left with “Candide the difference between you vs Edward is that Ed talks, whereas you read.” At any given moment this might be true, but i doubt anybody would care to know this. You might have a look at my blog to know a bit about me. Or let me spare you the effort: I’m fluent in six languages including Catalan and Spanish, and trust me, I do use all of them especially with their native speakers. Furthermore, I read the local (Catalan) press first, and more than the national one. That also shows on my blog, which you might or might not bother to read. Btw., I reckon you also know what “Albtraum” means in German.